Usage: Startnet software server, client and financial software. Data centers, retail stores management, corporate headquarters business management. Usage: Startnet software client. Distribution according to needs of lower replenishment shipments, inventory business management. Usage: Startnet software client. 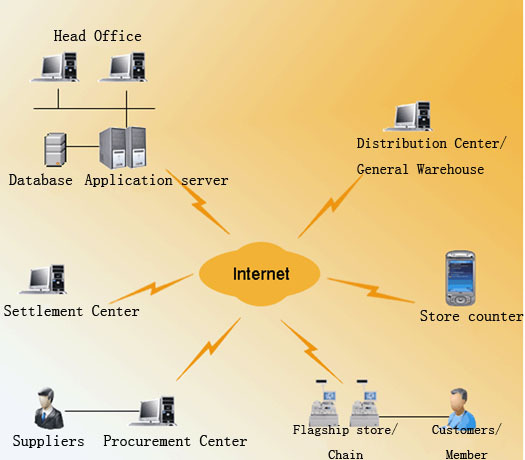 Replenishment needs of the lower pool, generate purchase orders, centralized purchasing. Usage: Startnet POS.NET software. Retail operations management. Store counter use: can not install computer and broadband business premises, the use of mobile POS + GPRS Kai network program, the other by POS.NET software.